WHERE: The Pacific Bonsai Museum is located on the campus of the former Weyerhaeuser headquarters at 2515 S 336th Street, Federal Way, WA 98001. PARKING: Free parking is available across from the Museum at the West Parking Lot; handicapped parking is available at the museum entrance. Admission to the event and the Museum is free. (Donations to support the museum are always appreciated). For those who would like to take home a memento, commemorative mugs will be available with a $10 donation to the Museum. WHAT: The Pacific Bonsai Museum invites the public to bundle up, take in the outdoors and enjoy the serenity of our collection illuminated by the soft glow of holiday lights at our our 5th annual 'A Bonsai Solstice.' This event is the only time all year that we open the collection to the public at night. 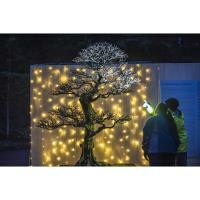 We invite the public to BYOF (Bring-Your-Own-Flashlight) to explore the bonsai by night. They can sip a cup of hot cocoa or coffee complements of Caffe d’Arte and enjoy a sweet or savory crepe from Crisp Creperie Food Truck. Live acoustic music will fill the woods with soft sounds and add to the magical atmosphere. A pop-up Night Market will sell nature- and bonsai-themed gifts. MORE INFO: The public can call the Museum with any questions in advance at (253) 353-7345 or email Liz Sullivan, Liz@pacificbonsaimuseum.org. Photo caption: Visitors explore the Domoto Maple at ‘A Bonsai Solstice’ (2017). Photo by Timothy Aguero for Pacific Bonsai Museum.